I couldn’t believe that it had been almost two years since we met them in the Florida Keys and went on the most incredible trip to the Dry Tortugas. Instagram has a way of helping us feel connected to all these adventure families and not realizing it’s been SO LONG since we met up in person. It was so fun for our kids to be with them again. The Curren’s kids are so great at starting up conversations with anyone and are so friendly it makes our kids feel so comfortable. Plus, the universal kid language of Minecraft always helps kids connect with each other. One morning Jess and I took the kids to the beach and it was such a beautiful day. I think it's nearly impossible to have a bad time when you have sand between your toes and the sound of the waves crashing near by. I made enough pies for 3 families. My Grandma Able would be so proud of me. We were so stoked that the Curren's brought their Sea Eagle Canoes with them and they invited Jonathan and I out for a early morning paddle. It was SO great to get away for a bit and have adult conversations without being interrupted. It was the perfect morning with a still lake and the fog was just an added bonus. If you have a chance to meet up with Jess and Sam or see them on the road, make sure you say hi. They’re the best. We enjoyed our time hanging out but then we said our goodbyes and headed up the coast to stay in Tillamook, OR. We found a great food truck and had one of the best burritos ever. We spent the evening at the Blue Heron French Cheese Company and holy cow! If you get a chance to stop by, make sure you grab some Smoked Brie, their Red Raspberry Preserves, some smoked meat of your choice, and homemade baguettes and you’re set for a late night snack…and breakfast the next morning. For about $1.00 you can pick up some feed to give to the farm animals. Heck, you may even a chance to teach an impromptu anatomy lesson. Jett said, “They’re being so romantic. Watching the sunset and mating.” HAHAHAH! 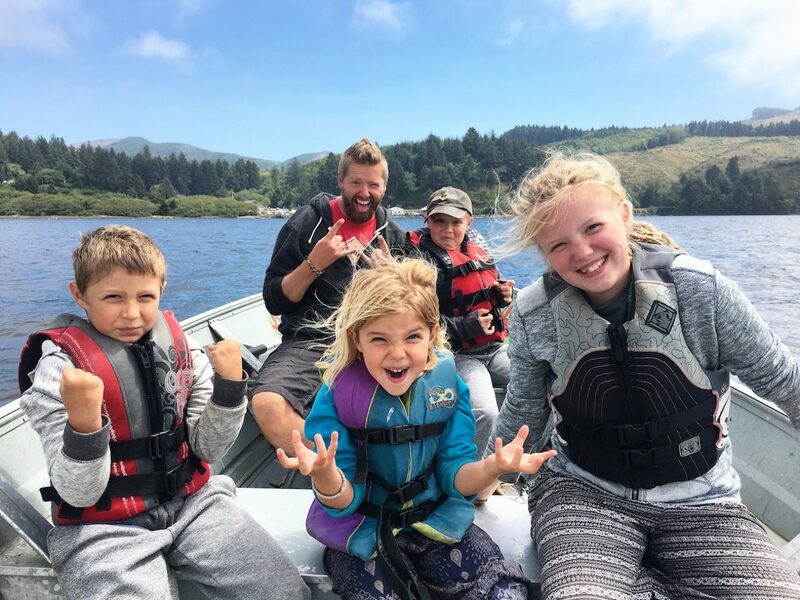 After getting our fill of the wonderful smell of Tillamook (DAIRY FARM LAND…imagine the smell) we headed on up the coast for what turned out to be a wonderful crabbing experience. The Curren’s told us of this place called Kelly's Brighton Marina and we had THE BEST time crabbing for the first time of our lives. We will for sure be doing that again. You pay by the hour and it was around $100 for all of us to get a boat and take it out for 2 hours and catch as many crabs as possible. It was such a fun experience. The kids loved it! We ended up with only being able to keep 3 of the crabs we caught because you can’t keep the females and they had to be a certain size. The best part of the whole experience is that not only do you get to keep the ones you catch…but when you bring them back to the dock, they’ll boil them up for you right there. In just 20 minutes you have fresh crab to try and they even serve it with garlic butter. Jonathan, Jett and Ada even tried the crab hearts! I still don’t like crab meat but it was still such a fun experience we would totally go back. If you find yourselves around the Nehalem Bay area, make sure you stop at Kelly's Brighton Marina! Worth every penny.